You put your right foot in. You put your right foot out. You put your right foot in and you shake it all about. You get the idea. 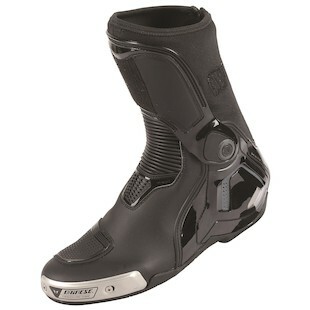 No matter if you like your boots in or out of your suit Dainese's Torque D1 boots will come in a version for you. The big re-design comes in the form of a new D-Axial system that improves torsion control while increasing airflow into and around the boot. The new Torque D1 boots are lightweight and designed for track performance. Magnesium inserts on the lateral and heel portions of the boot beef up the exterior of the boot. Replaceable aluminum sliders set these apart from boots in Dainese's current lineup. The Dainese Torque D1 In Boots' design are unique to Dainese. 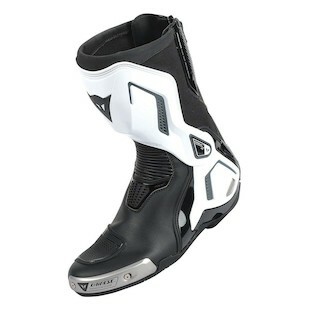 The boots allow you to wear a Dainese leather pant or suit over the slim top portion of the boot. Velcro attachment points keep everything in place. The look is quite dapper and the other track day enthusiasts will definitely make note that your boots are noticeably different. The Dainese Torque Out D1 Boots provide the style and protection synonymous with Dainese in a classic out boot design. Let the world know you are a speed demon with the Dainese logo right on your shin. 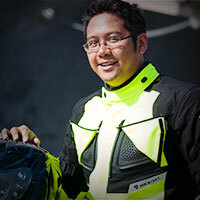 Dainese knows protection and style. The Torque D1 boots come in an In and Out version so you can have the unique boots tucked in look or the traditional boots out look. Both boots are top of the line when it comes to Dainese protection. New vents keep you cool while you're working hard on the bike. Either option will look great shaking it all about or turning yourself around. That's what it's all about!